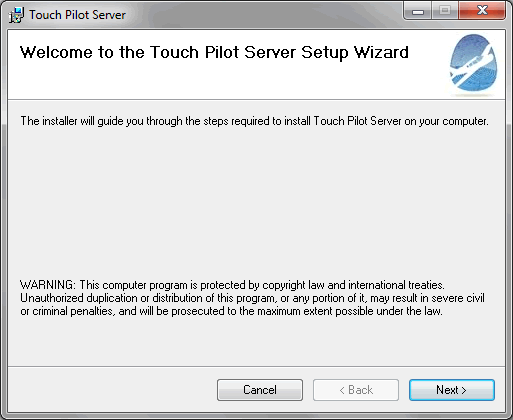 By downloading Touch Pilot Server, you are agreeing to the End User License Agreement. A private WiFi network that your PC and tablet are connected to. It’s ok if your PC is connected via wired Ethernet, as long as both are on the same network. All prerequisites are free downloads, and are not made by Touch Pilot. Microsoft .NET Framework 3.5 – Will be installed automatically if you don’t have it. Watch this video for a quick overview of the installation process. Step by step instructions can be found below. 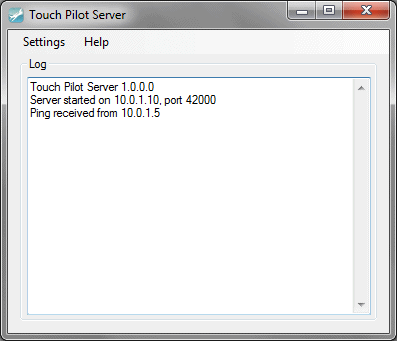 1) Install Touch Pilot Server. Click the link above and save it to your computer. Run the installer. At some point in the process, you may see a window like this. Click Yes. At some point you may see this window. This is for the virtual joystick driver. Click Install. 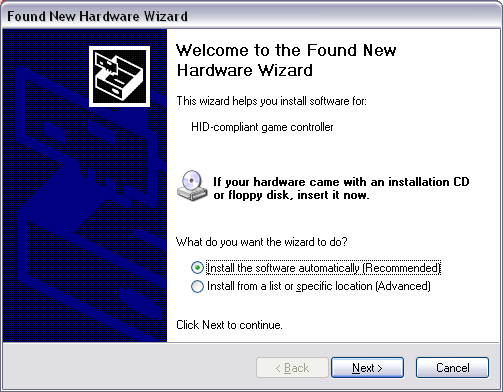 If you’re on Windows XP, you will see the New Hardware Wizard appear. Click Next, then Finish. This process could take several minutes. 2) Once it’s installed, you can run it from Start Menu > All Programs > Touch Pilot > Touch Pilot Server. 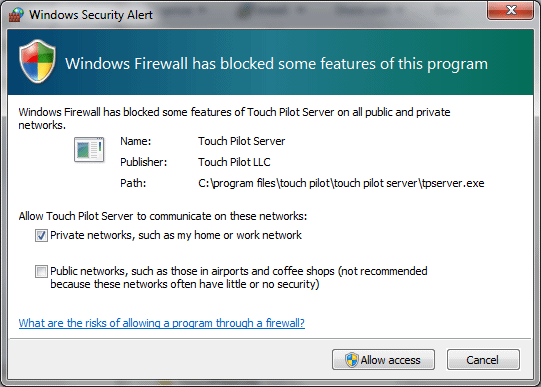 3) The first time you run Touch Pilot Server, you should see a popup from Windows Firewall. Click Allow Access. We recommend checking only private networks. Touch Pilot is not designed to be used on public networks, or the Internet. 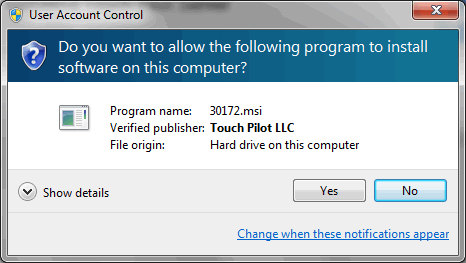 If you have an antivirus or security program on your computer, you may have to turn it off, or set it to allow Touch Pilot to use UDP port 42000, both incoming and outgoing. 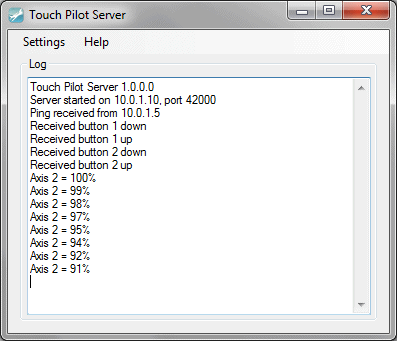 4) While Touch Pilot Server is running, open whichever Touch Pilot app you’re using on your mobile device. Make sure your tablet is connected to WiFi. The app will automatically search the network for a computer running Touch Pilot Server. In the upper left corner of the app, you should see a message that says you’re connected to your PC’s IP address. This message disappears after a few seconds. If you have trouble, please see our troubleshooting guide. 5) If you’ve successfully connected to Touch Pilot Server, you’ll see the message “Ping received” in the log window. 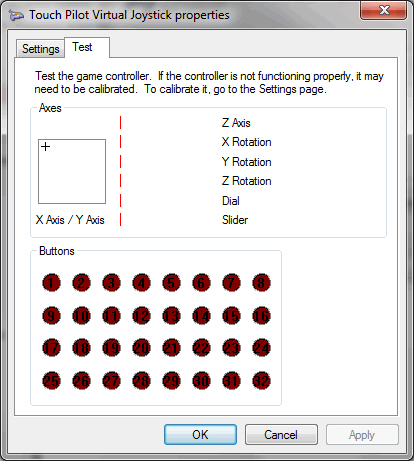 6) To test Touch Pilot, click “Test and Calibrate” under the Settings menu. It will open Windows’ game controllers control panel. 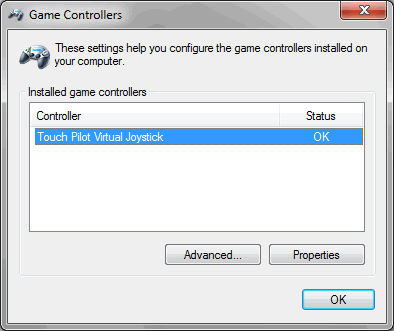 Click on Touch Pilot Virtual Joystick, then click the Properties button. 7) In the properties window, click the Test tab. In the mobile app, press the various buttons, and move the sliders, and check to see if they are shown in the properties window. Note that for Touch Pilot One the Comm buttons and Mic buttons on your tablet will not register here. Those buttons send keystrokes instead of joystick button presses. 8) You can also see the inputs being registered in the log window. 9) The last step is to map the buttons and sliders in the app to the controls in your game. If you’ve ever mapped the controls for a regular joystick, then this will be very similar. In most game, you open the control settings, click the control you want to map (such as throttle) then move the slider or press the button in the app that you want to map. For Touch Pilot One only: The trim wheels are not axes, like the sliders. They send button presses, therefore you map them just like you would any other button. Tap either side of a trim wheel, and you will see that it sends a joystick button press to the sim. It sends a different button number for each side of the trim wheel. So wheel left is one button, and wheel right is another. 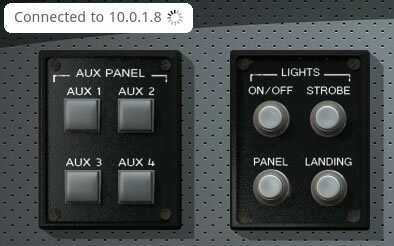 If you drag your finger across the trim wheel, multiple button presses will be sent to the sim. There are a few special instructions for FSX. 13) You’re all set, go have fun! If you have any questions or problems, please post in our forum. We’ll respond as soon as possible. Thanks!